"We always felt that if you do something with quality and integrity, then it's going to come back to you." hen you decide to build a custom home, you need to know and trust your builder. We believe that a solid foundation to the relationship between ourselves and our clients is as critical as the foundation on which we will be building their home. 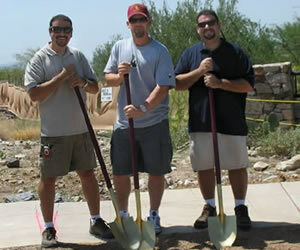 There are many builders in the Phoenix and Scottsdale area who could build you a home. Custom home construction is a competitive industry and while many of our competitors are our peers and friends, when you choose Desert Sky, you're choosing a company that stands head and shoulders above the field. First and foremost, we place a high emphasis on maintaining an unsurpassed level of quality. From the start, we work closely with our suppliers and sub-contractors to keep costs in line. Because we especially value our relationship with you, the client, we understand that value lies not just in keeping down the project costs, but realizing a maximum return on investment, providing the very best in design and materials that money can buy. With a few exceptions, we have always done the planning, architecture and construction work for our projects. We don't "outsource" responsibility. It would be a disservice to our customers. Over the years we have developed principles and procedures to guide our work, and have allowed to explore a diverse range of construction methods, environmental integrity and energy efficiency. Coupled with dramatic architectural statements, the resulting homes have not only won awards, but have enabled us to develop an enviable network of prized relationships with consultants, subcontractors, regulatory officials, suppliers, and, most of all, clients. We keep the layers of "administration" to a minimum; it's just Desert Sky Development and the client. We work as a team, with an open exchange of ideas and information. Although many other important contributors are involved, and become part of the overall process, this core builder-client relationship provides clarity and integrity to what is a complex, yet very rewarding experience. Ultimately, the proof is in our list of satisfied and, in many cases, repeat clients. Though we may not live in our finished homes, we never stop considering them "ours".